SMART Event Marketing provides complete solutions for the communication needs of a company by developing integrated Marketing and Public Relations campaigns. 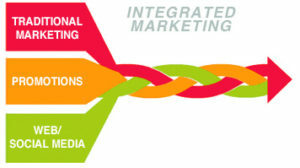 Integrated campaign includes a set of actions coherently combined in a strategy that combines tools, techniques and media communication and marketing with a strategic approach and creative which means brand awareness site, credibility, company image to the public to whom . Through skillful techniques, highlights the competitive advantages so as to create value products and services that our client offering. Integrated marketing communication strategies that exploit the available channels online and offline, to reach potential customers, say, medium and long term sales strategy through value-added products or services offered. Regardless of the field, competition is fierce and the use of multiple communication channels to highlight the competitive advantages, enhance value. Integrated communication strategy involves optimizing for multiple media: social networks, blog platforms store and distribution of press releases, identifying relevant topics for branding and product promotion, establishment of an editorial program for all environments and types of materials, drafting propriu- actual orientation materials made with quality content and relevant to the public, distribution of materials in environments set, reaction monitoring to adapt further communication, construction, development and moderating social media campaigns etc. SMART Event Marketing specialists will develop campaigns dedicated to your company by adapting the marketing mix in order to continuously synchronize promotional activities with the environment in which your company operates. This system is based on development strategies that ensure mobilization of resources for proper final goals. Because subordinate marketing tools and communication objectives and profile of your brand campaigns we propose are never linear and repetitive. Starting with an integrated communication regarding consumer insight that later turns into an idea of the campaign. The particularity of integration does not refer to saying the same thing on all channels, but to choose those media channels and tactics that have the potential to deliver the best performance and to articulate the message in executions adapted to each type of channel. The integration aims to achieve a congruence between the results obtained on each channel for each activation, so that in the end, the brand have ‘one voice’ on all points of contact with customers.